In The Heights is set over a period of 3 days, in the centre of a largely dominican-american neighbourhood in Washington Heights. It follows a small community consisting of ambitious, hopeful young people, who are dreaming of a better life but wanting to stay true to tradition. With music and lyrics written by Lin Manuel-Miranda (who is currently taking over Broadway with Hamilton), this show is a sensational masterpiece and one that I was so eager to see. Taken from an early draft in 1999, the show has had success after success. Starting on Broadway in 2007, the show has gone on to win 4 Tony’s, a Grammy and has had many other respected industry nominations. The show has continued to have productions all over the world, most recently at the Kings Cross Theatre, in London. The show has already extended before the official opening night – that is very rare. When you come away from the streets of London and head down into the “pop up” theatre, you instantly feel as if you’ve just walked into a New York subway (although this is a little cleaner). The welcoming music, the vibe, the atmosphere, all mirrors the place the show is set in. It’s like you’ve been transported to a different location for the evening. As I sat in my front row seat amongst a row of bloggers the buzz in the room was just electric. As the sell out crowd poured in and the lights slightly dimmed, I was so pumped and ready to be entertained. Through the mix of Miranda’s modern rap take on musical theatre, it instantly fits the theme of the play and the characters within. From the second Sam Mackay (who plays leading man “Usnavi”) entered the stage rapping the iconic self titled song “In The Heights” you just knew that what you were about to witness was going to be special. The fierce, fearless choreography just adds to the flavour and passion that these characters have. It really does bring the show back to its roots and you know you’re in for a treat. Trust me, you’re not disappointed. The whole production is just so on point. From the portrayal and story telling to the Spanish translation, I honestly can’t see any fault. It occurs often that when a group of people work together for a lengthy amount of time, enduring rehearsals, tech, 8 shows a week etc, they are branded “family”. However, through this performance you don’t even question that statement. They all work together so well and are very much in sync in regards to the harmonies, interactions with each other, the movement around the stage, I could go on. 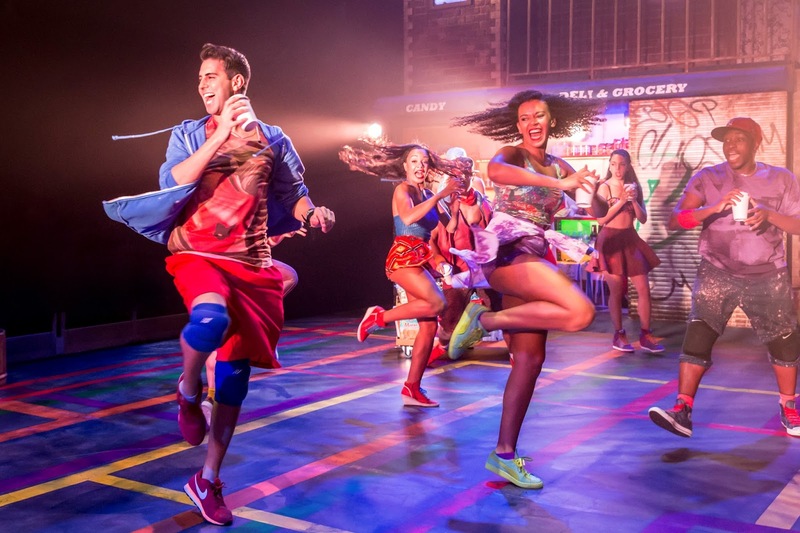 It’s a musical with an edge that makes you feel so euphoric you want to get up and join in. You believe everything that is being told through the motion, the script, the acting etc. Surely for any producer/creator of a show thats the key important element. With a very versatile cast, a fantastic ensemble and a talented band to accompany, the show delivers such a high standard. Sam’s portrayal of Miranda’s iconic role ‘Usnavi’ is told perfectly through his dedication to the role and his likability that makes you instantly root for him from the word go. Broadway’s Joe Aaron Reid as Benny has the perfect combination of humour, seriousness and emotion as he tries to prove himself to his boss who just happens to be his love interest Nina’s father. The stunning voice of Lily Frazer, fits in perfectly with the personality/charm of the character and love that the community seem to have for her. I think I was most pleasantly surprised by former Sugababe, Jade Ewan’s performance of Vanessa. It is no secret that she has an amazing voice, but I didn’t realise how powerful it was until watching her in this show. It seems like the perfect casting for her with theatre being her calling. This really isn’t a show to be missed. With a fantastic score, empowering storyline of love and loss and a great bunch of talent. Hurry down for a night In The Heights, before it’s to late (and don’t worry, the tickets aren’t £96,000). To book tickets check out http://www.intheheightslondon.com/ (there’s a special rate for under 25s). What are you waiting for?